The Stealth Swimmer is a Minifigures minifigure released to celebrate the Olympics in 2012, as a part of the series 8909 Team GB Minifigures. The Stealth Swimmer's body is entirely yellow, except for faint muscle printing on his torso, water droplets, and the blue, white, and red Team GB Swimsuit he is wearing. His face has a calculating expression, and he wears goggles. On his head, he wears a white swimming cap with the Team GB logo on it in red and blue. Like all the Team GB minifigures, he wears a red and gold medal. 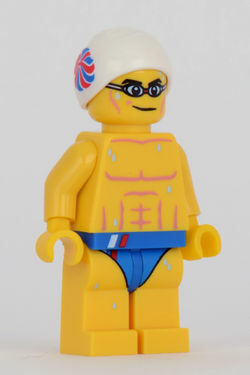 This is the second Minifigures swimmer to be released, the first being the Swimming Champion. This figure reuses the new swimming cap mould, and the gold medal piece, prominent throughout the special Team GB series. Facts about "The Stealth Swimmer"